Quick Hero Creation! A few die rolls are all it takes to create your hero, giving you the spark for your imagination to bring it all together. Describe character abilities on a numerical scale, or use adjectives like "Great" and "Amazing," as best suits your style and situation. Flexible System! Just a few basic game mechanics resolve in-game actions, but they expand to cover a wide range of options, making Icons easy to learn, but broad enough to keep things interesting. Heroic Determination! Bring the qualities of your heroes into play to gain advantages or perform amazing stunts, or to create trouble, from personal drama to weaknesses, in order to make your hero even more determined to save the day! Universe Creation! Collaborate to create your own comic book universe and play out the stories of the different heroes in it. 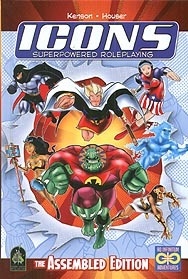 Icons is your all-in-one package for superhero roleplaying adventure: quick, easy, descriptive, and fun!